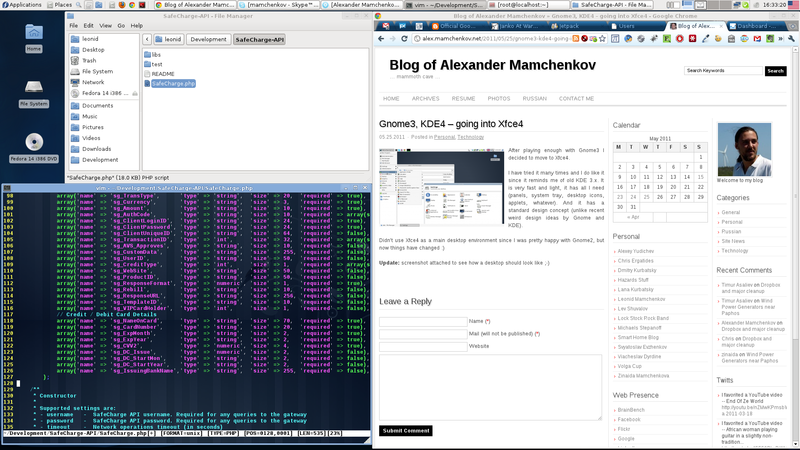 After almost a full day of tweaking configurations and swearing at both Gnome3 and KDE4, I decided to follow my brother’s advice – try Xfce4. This is yet another desktop environment available in Fedora 15. I’ve heard a few good words about it, but never actually tried it out. Today was the day. The first look around after a quick installation showed that most of the things I’ve been fighting with in Gnome3 and KDE4 just work. Xfce4 uses a lot of configuration from those other desktop environments, but somehow it actually understands what the user wanted to configure, even when neither Gnome or KDE do. Xfce4 has a very simplistic tough to it. It feels at firs that something is missing. And maybe something is in fact missing. But after working with it for a couple of hours, I still didn’t realize what it is. Maybe it’s not as polished or as wow-ified as other desktop environments. But it works! All I needed and wanted for my daily routine is there – desktop icons, panels with application shortcuts and widgets, keyboard switcher with flag icons, useful workspace switcher with application thumbnails and windows drag-n-drop support. Even more surprising was the fact that Xfce4 picked up my font preferences. Gnome3 was configured with nice fonts. KDE4 was configured with nice, but other fonts. And they didn’t want to recognize each other’s font configurations. Xfce4 got with no effort on my part! After losing almost a full day to configuration and tweaking I finally have a desktop environment which I can actually use. Hooray!